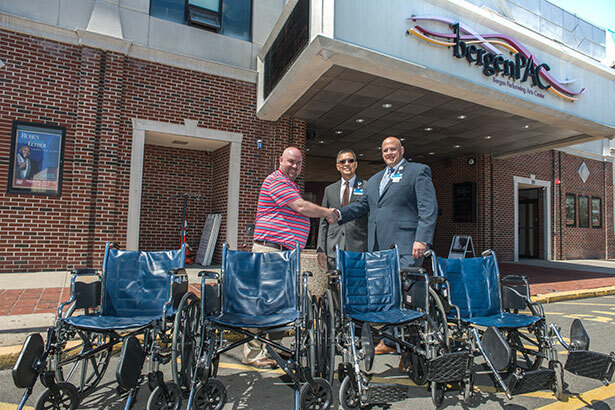 Marc Farrand (far left), on behalf of bergenPAC accepts four donated wheelchairs from Englewood Health. Pictured from left to right, Marc Farrand, bergenPAC, Ernie Cantos and Richard Sposa, Englewood Health. August 2, 2018 – Englewood Health recently donated four wheelchairs to the Bergen Performing Arts Center (bergenPAC), in Englewood, New Jersey to help ticketholders with physical limitations navigate the facility and provide them with necessary accommodations before, during, and after show times.